May in Vermont is an interesting time of the year. One day you might see blue bird skies and temperatures well into the 70’s and the next snow and sleet falling from the sky. This was the case for us on our one day to fish for the week. With snow on the ground, we weren’t sure if we should bring the ice gear or the boat! We decided the boat would serve us better although on our way to the lake we did pass a snow plow pushing a fresh and heavy six inches of snow out of the road. Our destination for the day was a new spot, a place we thought would have the target species of crappie. We had received a tip so we decided to check for ourselves. We arrived at the launch to a light dusting of snow, prepared the boat and off we went. The body of water is large however we were only focusing on a medium sized secluded bay. 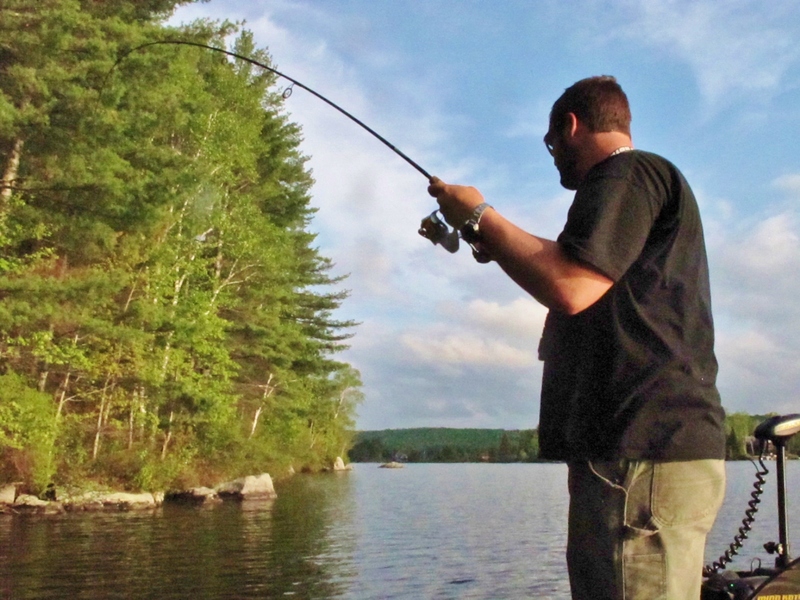 We set the trolling motor to parallel the shore and began casting. 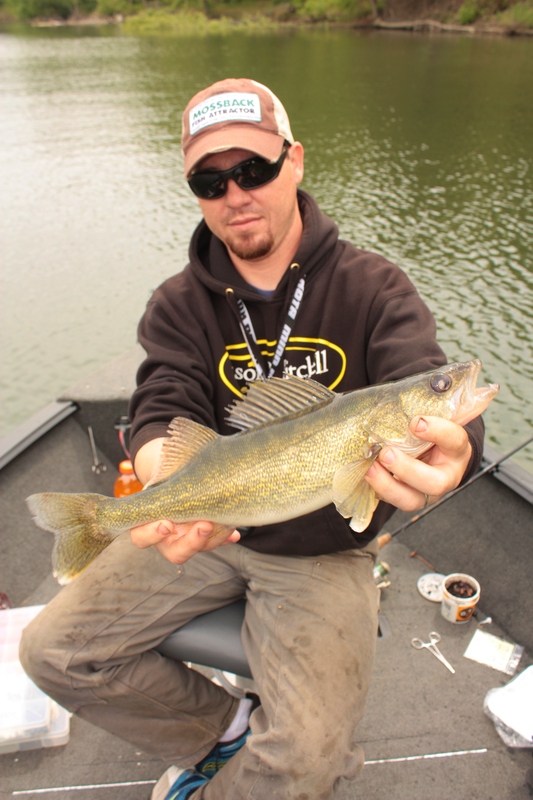 We were using the “Live” Baby Shad from Lake Fork Trophy Lures under a bobber varying our depths as we went. This would allow us to determine the depth the fish might be holding at. Water temperatures were in the upper 50’s and the conditions were right to find fish in either spawning/post spawning patterns because the temperature had dropped recently. 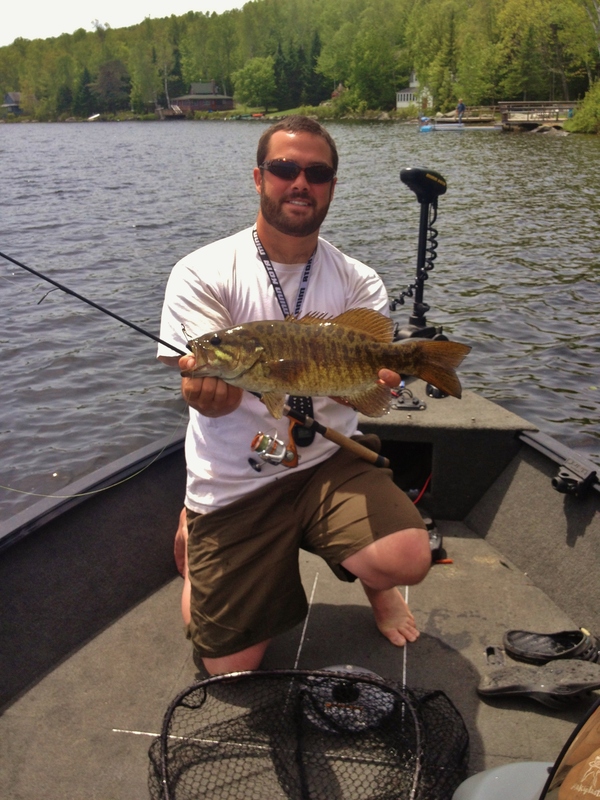 The first cast produced a nice smallmouth which was hopefully a sign of things to come. It didn’t take long for us to determine that the fish had slid out of the shallow water due to the sudden cold front the northeast was experiencing. We then shifted our attention to structure between shallow shorelines and sharp drop offs. We came to a partially submerged tree that just looked fishy. 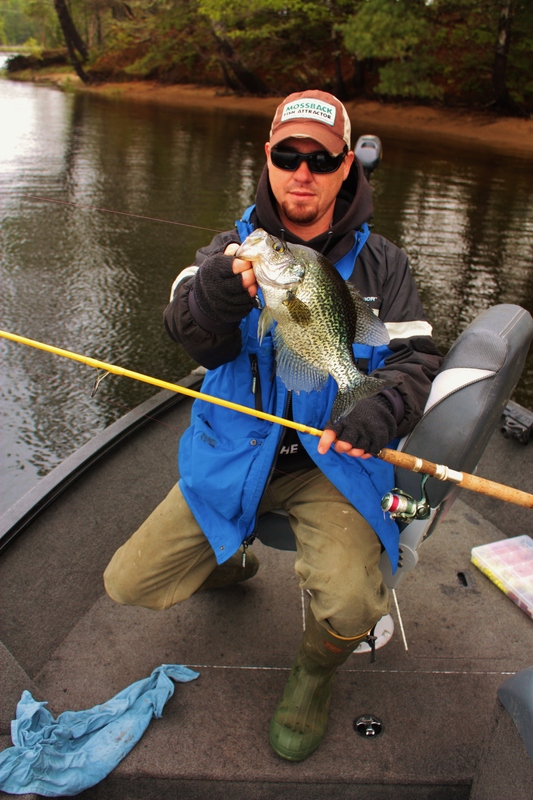 As expected the bobber slowly slid under the water and attached to the other end of the line has a healthy crappie. It seemed like the big fish were in a post spawn pattern, they were scattered through out the lake slowly moving towards structure. Had we had more time it would have been a good idea to get a better “lay of the land” and search for the main basin’s with hopes of finding school’s of post spawn crappie. As it turned out, the best concentration of crappie we could find was within spitting distance of the boat launch, and for the first time in my life it seemed that the fish were relating to the rocks and boulders for cover. 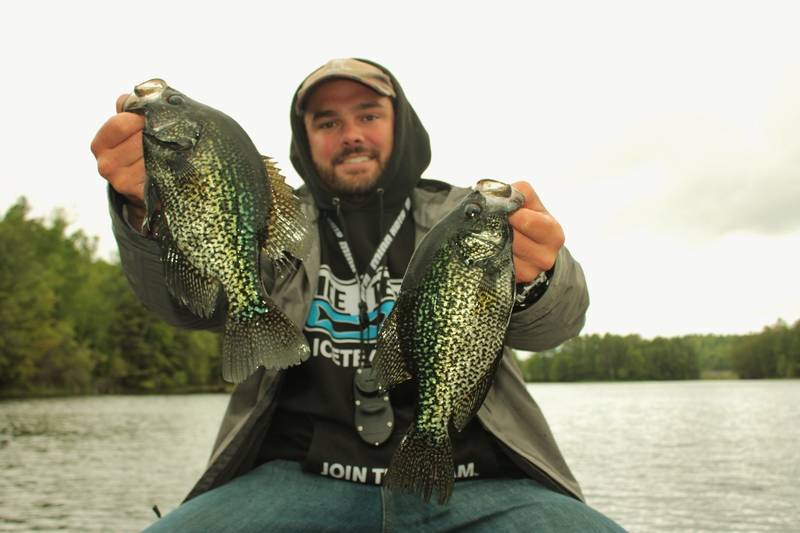 The joke of the day was “in order to catch crappie, fish for smallmouth!” We managed to have a quick flurry of action catching mostly crappie with an occasional rock bass. 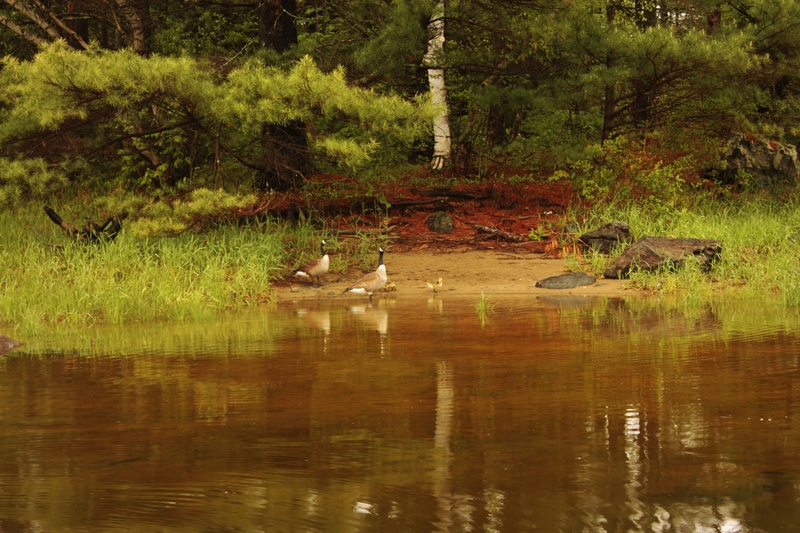 We began to explore the last shoreline just as the weather began to deteriorate. 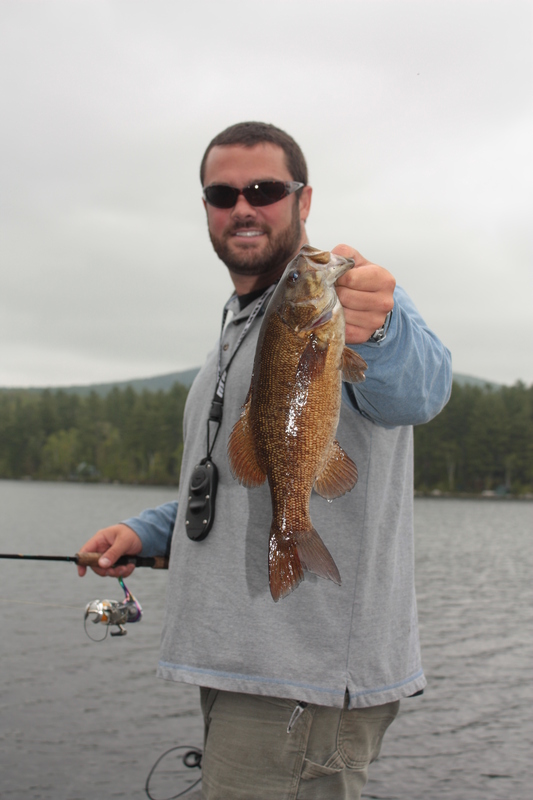 We were able to catch a few fish going back to pattern one which was shoreline structure adjacent to deep water. The wind picked and and the sleet and rain started again so we loaded the boat and called it a day. All in all this was a very successful day of fishing as we found a new spot. With better conditions we would have boated more fish but even still, we now have a new location to focus and pattern crappie. We weren’t rushing to get on the water today. The last few days had produced a better mid day bite than at first light and the weather was suppose to be fairly calm all day. We were launching the boat close to 7:15 and were dropping our first line shortly after. 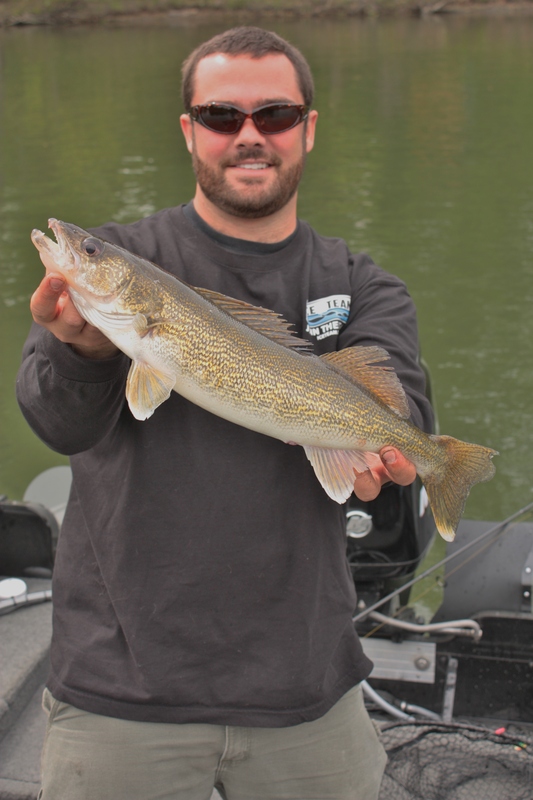 We putted through the shallow water watching the fish finder to see if we could find a pod of walleye. We went a while before catching the first fish and as it turned out, a dinky white perch wasn’t all that exciting! We finished off our slow drift with no other excitement. We decided to move in the same direction as many of the other boats were going. We drove through the maze of other boats and from what we could tell, the fishing was slow. We continued past every one else and up to a deeper hole with only two other boats. The first pass through took a few of our grabber rigs. Once we got a hang on bottom structure, a few fish started to come our way. 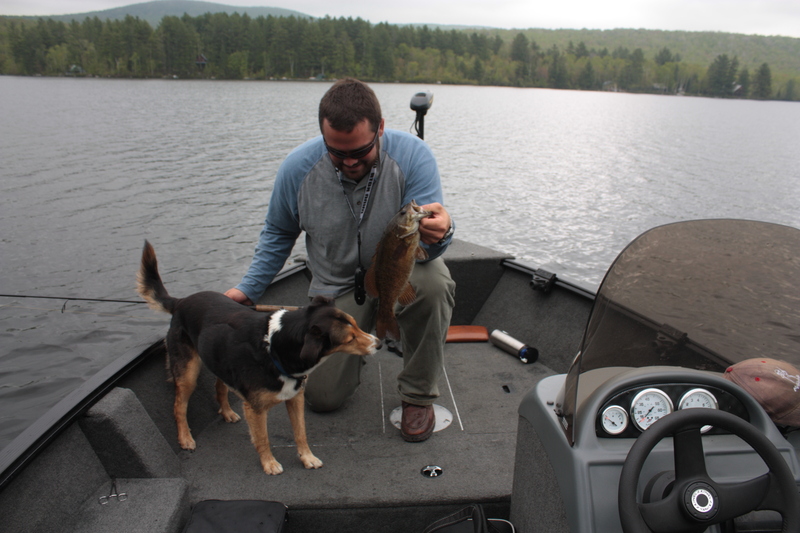 We picked a few rockbass and smallmouth before hooking into the first walleye. It was a little over 19″ and right in a thick mix of woody debris on the bottom. A few more drifts through the same area produced no fish but we kept at it. Drift by drift we found a section of bottom that wasn’t completely filled with snags and held some fish. The other boats in the stretch were onto the same spot and were picking fish at about the same rate that we were. 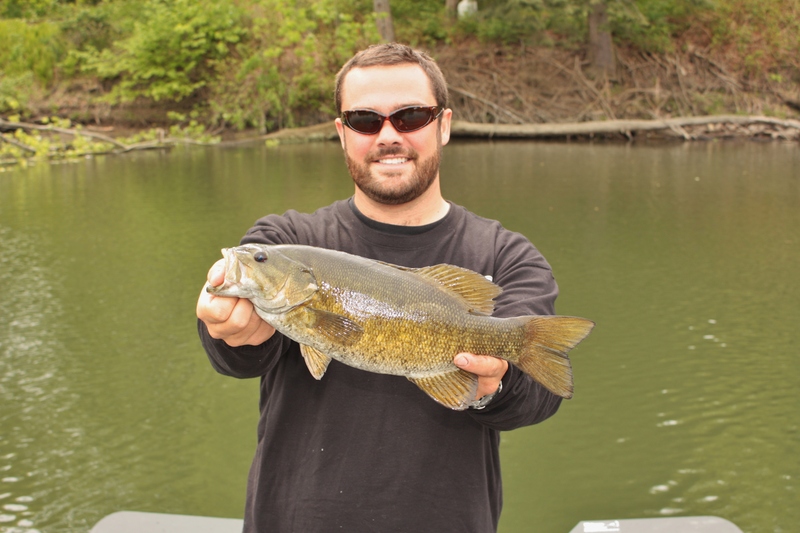 We got to see a few walleye, a huge sheephead, and some nice smallmouth bass. Overall the fishing was slow but we caught some nice fish. The wind picked up and ultimately made the call for us that it was time to go home. Our jigs could hardly touch bottom because we were moving so fast and when it died momentarily, the lines sunk and snagged up. We were on the road home shortly after lunch time.